Tuition is a yearly amount divided into equal bi-monthly payments due in September, November, January, March, and May. Payments do not vary depending upon the number of classes in each two month period. If a student begins part way through a two month period, tuition will be prorated to reflect the number of classes they will take. We also offer a family discount so that additional family members receive a 10% discount on tuition when one dancer is paying full tuition. Discount is taken from the lesser tuition. The more classes a student takes, the cheaper the price becomes per class. We increasingly discount tuition at each hour increment to help families afford their child’s love of dance. A completed and properly signed registration form is required of all new and returning students every calendar school year. The registration is $25.00 and is valid through August. Tuition is an annual rate and is divided into five bi-monthly payments due in September, November, January, March, and May. Tuition is due by the 1st of each payment month. A 15% late fee will be applied to payments received after this. For new students, the first class is free; however, we do need a registration form completed before anyone can take class. For students participating in the annual production: A $50 costume deposit per number is due by November 1st. Also, the May and June payments are due no later than May 1st. Payment in full is required regardless of class attendance. Tuition is non-refundable or transferable. If for any reason, the student misses one or more of her/his regularly scheduled classes, she/he has the opportunity to make up these absences within four weeks in an alternative class approved by the director. If a student at our school refers a friend to our school, and the referral dances for at least three months, the student receives a $15 credit towards their tuition. 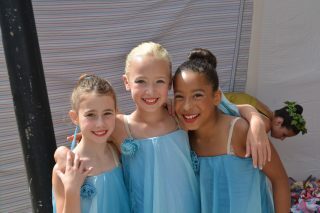 If you were referred to Dimensions in Dance by a friend, please list the friend’s name on the registration form.